A far-out post on 'optimization' and 'parameter estimation'. No two microwave ovens behave the same way even if they have the same power rating and capacity, and over time they show increased randomness in terms of energy usage and solution quality. Each one has its idiosyncrasies and as you move between apartments over the years, it is irritating to adjusted to a new oven. After you invest all the time in figuring out that the optimal settings to warm your cold coffee is 50 seconds in the previous home, using the same timing with the new one results in a lot of spilled coffee. Furthermore, objects get heated slightly quicker when placed in certain locations of the oven. What is a quick way to optimize your vessel placement and minimize your turn-around time? Enter, the Appalam. 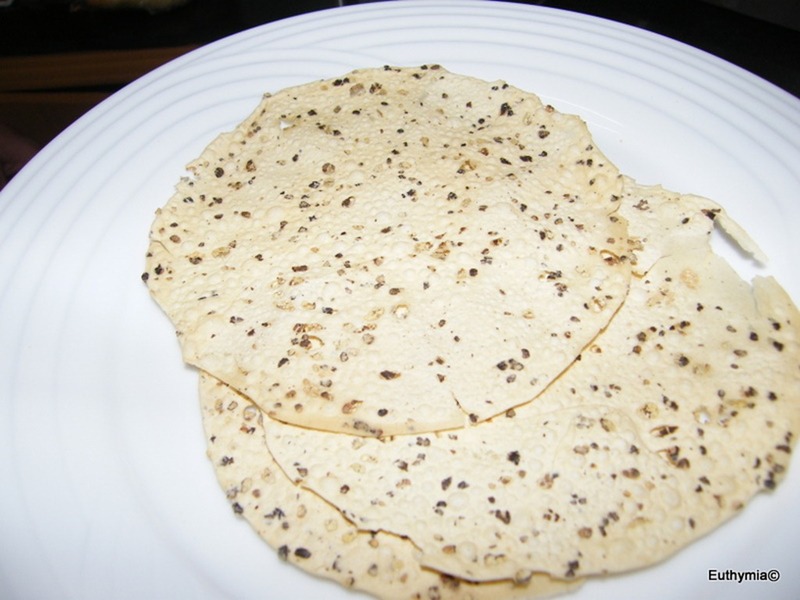 The Appalam or the Pappad as it is called in Northern India is a circular, flattened, wafer thin dry mixture of lentils and spices. It is an almost fat-free, delicious snack if you microwave it although it can also be fried. In particular, the best brand for this test is the Lijjat Pappad. This one is hand made (or used to be). The Lijjat company rose from a tiny all-women cooperative start up in rural India (based on Mahatma Gandhi's principles of self-reliance, theirs is a remarkable and inspiring success story) and is still going strong, producing outstanding Pappads in a variety of flavors. 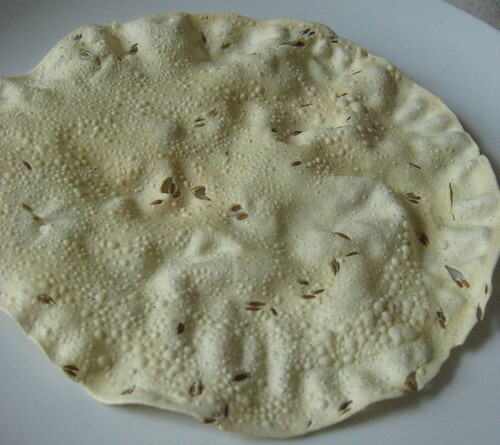 The idea is pretty simple: The Lijjat Pappad (LP) has a relatively large surface area that covers 75-100% of the circular glass tray in most residential microwaves. Microwave the LP for about 60 seconds and note which of its parts get heated up first (visually seen via a change in color) and how the cooking progresses. Within 60 seconds, you should be able to figure out the hottest and the coldest spots in the oven. In my current residence, the middle of the oven turned out to be the coldest, which was the exact opposite of the result in my prior residence. Of course, this is not intended to be a universal setting and only applies to a subset of foods being heated up. 1. The consistency of the LP mix is quite remarkable. It is neither thick to resist microwaving, nor too thin and very rarely exhibits any significant warping even after 120 seconds of microwaving (it will simply get carbonized before it warps). 2. The material naturally does not conduct heat well and convection doesn't help much either, so the localized heating effects show up visibly. 3. You can make a meal of your experimental subject once your test is complete. No test goes waste! There are gazillion alternative ways to tie your shoelaces of which only a few patterns are easy to remember and possess nice symmetry. My daughter got her first laced shoes a few weeks ago. As she took it out of the box, the first noticeable thing was that the slack required to tie the laces appeared to be on the shorter side. This posed difficulties for my daughter while she was learning to make those neat knots. Rewiring the shoes resulted in quite a bit of slack, which resulted in big knots that not only helped her learn quickly, but also seemed irresistible to her kindergarten classmates who kept tugging at it. So the aim was to find a lacing pattern that would generate just the right amount of slack. This is of course an instance of a Traveling Salesman Problem (TSP). Each lace hole represents a city which can be visited exactly once. For example, the slack is maximized by finding the shortest tour, while the slack can be minimized by finding the longest Hamiltonian circuit. Of course, my daughter would prefer finding a good balance between these two extreme solutions, while also ensuring that tightening and loosening the laces are relatively easy to perform. The former objective can be equivalently specified in terms of minimizing deviation from a desired tour length, while the latter requirement can perhaps be approximated by eliminating unfavorable connection patterns and reducing overall friction. Any OR person will tell you this: just because the TSP is a notorious NP-Hard problem, it does not automatically mean that practical instances are terribly difficult to manage. On the contrary, OR methods excel in quickly finding amazingly (and provably) good answers to practical instances of underlying TSP substructures within decision problems across a variety of industries.